Homeschool Preschool: A Great Experience! Many moms are teaching preschool age children. Some of these wee ones are the youngest children in their families, while others are the only ones in the family. No matter what the scenario, homeschool moms want to help their little ones to grow into happy and active learners. 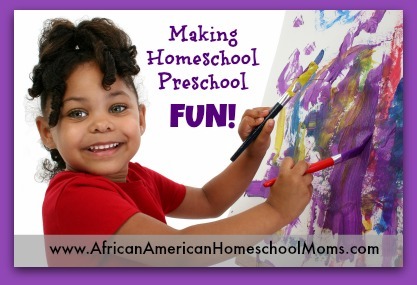 This can be done by creating a fun and creative homeschool preschool! Preschoolers are an active and intelligent group of learners. They are eager to learn and they absorb information as quickly as sponges absorb water. In order to have a successful homeschool preschool experience, moms must offer these little learners a variety of fun and educational play options. In addition, moms must rotate activities and introduce new ones frequently so these young children do not get bored and become mischievous. Today I’m sharing a few of my favorite and easy to recreate homeschool preschool activities. Don’t feel pressure to create everything at once. Add a new activity each week and within a month or so, you’ll have a fun and engaging homeschool preschool your child will love. Ready. Get set. Go, mom, go! Bubbles: Our bubble supply stays well stocked throughout the year. In our carpeted basement, I allow Baby Girl to blow bubbles. The small bottles you pick up at the local drugstore are fine, but be sure to save the bottles and purchase lots of bubble juice refill or make your own if you’re crafty. We were introduced to Gymboree’s Bubble Ooodles by our local librarian and we LOVE them. Bubble Ooodles create gorgeous bubbles that last a long time before popping. But beware! Popped bubbles leave behind an icky residue, so I wouldn’t use them near wooden surfaces or countertops. In our house, Bubble Ooodles are for use in our carpeted basement or outdoor areas only. Do a Dot Markers: I seriously want to send a birthday gift to the individual who created these markers! They’re fun and help improve fine motor skills and they keep Baby Girl engaged for quite a long time. Each Do a Dot Marker contains colored liquid housed inside a sturdy plastic bottle with a sponge tip. In order to apply color, preschoolers remove the cap and apply color by dotting the page. They can use this method to create their own unique picture, or they can apply color to free Do a Dot art pages. Dress Up Clothes: We have several bins of dress up clothes for play and as you can see, even some eight year olds still like to play with them. The princess costumes are among the favorites, but we also have conductor, fireman, and police officer costumes for gender neutral play. Though you can buy new dress up clothes, they tend to be quite expensive, so consider adding dress up clothes to the birthday wish list you share with your family and friends. You can also hit yard sales, Ebay, or Goodwill stores to find washable dress up clothes in great condition. In the days following Halloween, costume stores often marked down merchandise by 50% or more. Stop by and purchase a few for the dress up box. Be sure to check places like Craig’s List as well. After Halloween many people are trying to unload the Halloween costumes that have only been used once or twice. 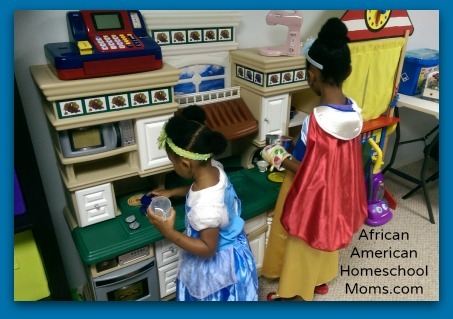 Kitchen Play: If space permits, add a play kitchen to your homeschool preschool. This is a great way to tap into your preschooler’s imaginative nature by allowing them to bake, blend, wash, and serve. The kitchen set in the picture above retailed for over $100, but I grabbed one from Craig’s list for only $40! Be sure to stock the kitchen with lots of play food and cooking supplies. Play Dough: Play Dough is a fantastic medium for young children. So many things can be done with it. Create a Play Dough bin and fill it with several containers of colorful Play Dough, miniature rolling pins, toddler safe scissors like these Melissa and Doug Safety Scissors. You can even use Play Dough to help preschoolers make the letters of alphabet using these awesome free Play Dough mats from 123 Homeschool 4 Me. Pony Beads: I love these colorful beads because they can be used in a variety of ways. (If you’re not sure what Pony Beads look like, check them out here.) They look similar to small candies, so you’ll need to make sure your child does not eat them. I give Baby Girl several pipe cleaners and allow her to string the pony beads onto the pipe cleaner. Though the pony beads don’t normally slide off, I recommend making a hook or loop at the bottom of the pipe cleaner just in case. I like to make the pipe cleaner task more interesting by asking Baby Girl to color code the beads (red beads on red pipe cleaners, blue beads on blue pipe cleaners) or by asking her to recreate a pattern on the beads (green bead, purple bead, orange bead). Another great way to use pony beads is by having preschoolers use tweezers to pick them up and sort them. This is another excellent exercise for fine motor skills. I line up six small glass votives and drop a single colored bead into each one. Baby Girl then uses tweezers to pick up and drop colored beads into the correct votive. Keep beads, pipe cleaners, votives, and tweezers contained by adding them to a serving tray. This way if supplies roll around or get dropped during play, they don’t end up on the floor. Magnets: Preschoolers love the Magnet Fishing Game and creating your own is easy to do. Find a simple fish pattern and trace several fish onto several colorful pieces of paper. Laminate the fish for durability and then use a hole punch to punch a hole near the mouth of each fish. Insert a metal paper clip into each hole. Tie or hot glue a thick ribbon to a stick or dowel and attach a magnet to the end of the ribbon. 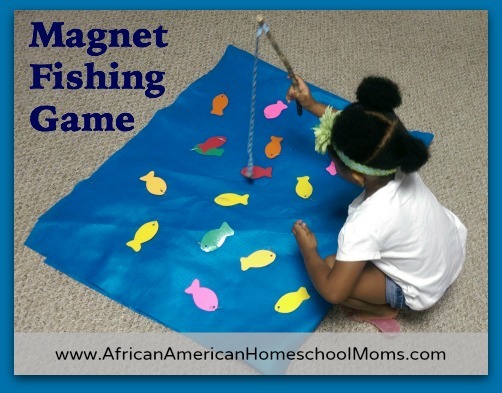 Have your preschooler “catch” fish by using the magnet on the rod to touch the paper clip on each fish. Pattern blocks: Help your little one learn more about shapes and patterns by using pattern blocks. You can purchase pattern blocks at an educational store such as Lakeshore Learning or you can buy them from Ebay like I did. After you’ve got your pattern blocks, download and laminate some fantastic pattern block pages from Prekinders.com. Keep your preschooler interested by adding themed pattern block pages for holidays or specific unit studies such as animals or transportation. Preschool at home is possible and it doesn’t have to cost an arm and a leg! With a bit of time and patience, you can create activities that will keep your preschooler learning happily. Are you homeschooling a preschooler? Do you have any tips or tricks? Feel free to share what you’re doing by leaving a comment below.